T by Alexander Wang Twisted Mini Skirt in Black. 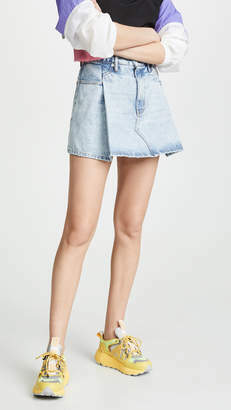 - size XS (also in S,M) T by Alexander Wang Twisted Mini Skirt in Black. - size XS (also in S,M) 79% viscose 17% polyamide 4% elastane. Hand wash cold. Fully lined. Elasticized waist. Stretch fabric. Skirt measures approx 19 in length. Imported. TBYA-WQ64. 4C495002H3. Alexander Wang is known for his casual mix of refined silhouettes and urban chic. His eponymous line offers a provocative twist on day-to-day garments, where street meets luxury and ones personality shines through style. T by Alexander Wang offers the same ideals, but is centered around tee shirt dressing and pushing basics to a whole new level. Think stretched out necklines, muscle tees, mini patch pocket detailing, and shades of gray, white, and black with pops of color.